We are excited that you are considering a baptism at Good Shepherd. We look forward to helping you take this next step in your faith journey. Most of the information on this website pertains to baptism of children, but much of it will pertain to adults as well. 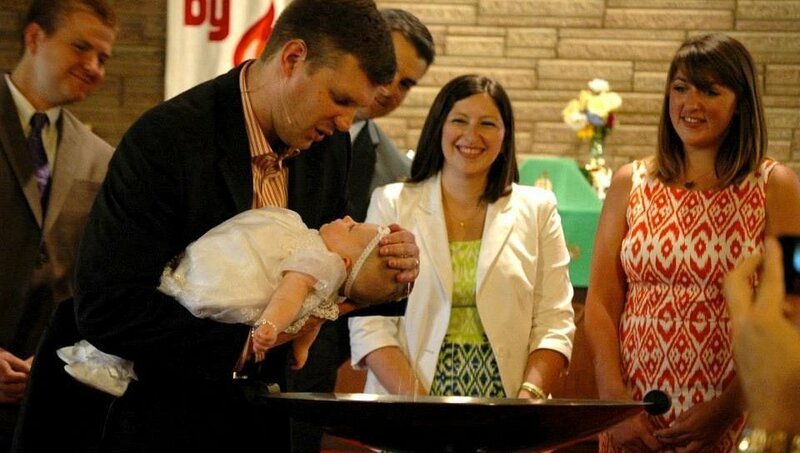 Scheduling your child’s baptism can be done by contacting one of our pastors. Our pastors will set up a time to meet with the you (usually about an hour) to review the basics of our belief and practice in regards to baptism. Through baptism, a child is being brought into the community of faith. Therefore, baptisms are held during public gatherings of God’s people, typically Sunday morning worship. We allow baptisms to be scheduled almost any Sunday throughout the year with few exceptions. Children or adults may be baptized at any age. Baptism is the beginning of a new life in Christ for your child. It is a the start of a covenant relationship, much like marriage. You play a very important role in helping your child develop this new relationship and to realize the full benefit of their baptism. What this means you will be making a commitment to 1) nurture your child’s relationship with God, the church, its pastor and members. 2) bring your child to worship on a weekly basis. 3) teach your child to pray at meals, bedtime, and other occasions. 4) provide for their Christian instruction at home, in Sunday School, and other children’s programs provided by the church. 5) Bring your child to confirmation. 6) Celebrate your child’s baptismal birthday. 7) Provide an example of a Christian life. 8) Provide them with a Bible at the appropriate age and help them to read it. To fulfill these promises, families who plan to baptize their children at Good Shepherd ought to be members who are actively involved in the ministry of the church. If you are not a member of Good Shepherd, we ask that you would attend Sunday morning worship for two months prior to the baptism and make plans to attend our next new member orientation to become members. Baptism is a gift that God gives to us. But with any gift, if the gift is not opened up, it is a wasted gift. We want you to be able to fully open this gift and discover the full blessing of baptism. Sponsors are to be baptized and with good standing membership in a Christian Church. Otherwise it would be difficult for them to take responsibility for the promises that they and the parents make at baptism. As parents choose sponsors, they should consider individuals who would be role models and would take seriously the Christian nurture of the child. When at least one sponsor is a member of Good Shepherd a special relationship with the faith community can develop. Though this is not required, it is an option parents ought to carefully consider. In addition to sharing the responsibilities above, the sponsors could help make the anniversary of the child’s baptism an important occasion by giving cards or gifts or doing something special on that day. Good Shepherd does allow pictures and video during the baptism. We just ask that pictures are taken in a discretionary manner and that the use of flash is limited. We advise the one family member be designated as the official photographer and to share the pictures with other family members. Adults desiring baptism are asked to participate in our new member orientation. These orientations are offered several times throughout the year. For information on the next new member orientation visit our membership page.